The McCriollo turned out to be about the same as an EggMcMuffin except on a decent chewy/crispy split bun. The name translates to "McCreole," which may make more sense in Puerto Rico, but sounded like wishful marketing to my ear. Nothing about this sandwich tasted "creole." Then again, I'm kind of defensive since Creole culture spawned one of the world's top three sandwiches in the muffuletta. Versus an EggMcMuffin, the McCriollo sports the beefier roll-style bun, and tastes much the same. The cheese and egg disc tasted identical. The ham tasted blander than the McMuffin's bolder Canadian Bacon. Big ups to Canada for winning a rare spiciness decision versus Latin America. I feel confident saying this now: Canadian bacon is better than plain ol' ham. Sides are important, of course, and with any McDonald's #1 combo, your best bet is a coffee and hash browns. It's classic. If you're anti-caffeine for some strange reason, OJ is an acceptable alternative. The Puerto Rican hash browns tasted more like butter than corn than I'm used to, but that could easily be due to a mental prejudice against U.S. corn over-use. I have no idea -- and couldn't find any information about -- corn consumption in Puerto Rico during my brief research of the topic. 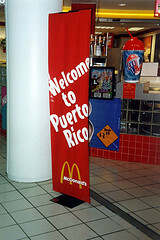 So I'll go ahead and assume that Puerto Rican McDonalds use less corn in their preparations, whether that's correct or not. Verdict? Who cares? It's an EggMcMuffin on a roll instead of an English muffin. If there's a lesson to be learned here, it's that Puerto Rico is ripe for an English muffin invasion. Once the good people of the enchanted isle find out how much butter an E.M. can hold, perhaps they'll come around. Of minor note, the receipt listed the McCriollo as a McJamon. It seems whoever's in charge of breakfast marketing for Puerto Rico decided "Creole" was more appealling than "ham," and rightly so. Your work here is important. Don't let anyone tell you otherwise. Glad to have you back. Thought we'd lost you, there. Great review - sounds delicious to me. I'm more of a fan of rolls than English muffins anyway. I'm intrigued by the buttery-tasting hash brown though...I'm sure you're correct in the fact that Puerto Rican McDonalds uses less corn in their preparation. It just has to be so. Your encouragement is a shot in the arm as I work through the backlog of unposted entries and catch up on the latest sandwich happenings. I'm sure I speak for all your fans when I say that I'm eager to read all those back-logged posts.